Carillion plc. 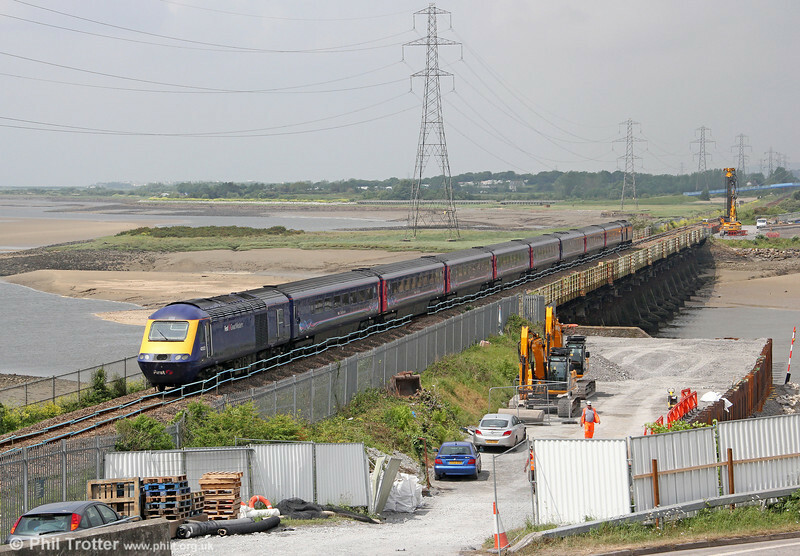 is carrying out preparatory work for the rebuilding of Loughor Viaduct which will form part of the £40m project to redouble the line from Cockett West to Llandeilo Junction. Final planning permission is now in place for the viaduct to be renewed, which is understood to have been the last major hurdle for the work to go ahead. Early activity has included the construction of a quay (right) for barges which will transport materials to and from the worksite. This was the scene on 2nd June 2012 with 43022 heading 1L62, the summer only 1000 Pembroke Dock to London Paddington.